We are currently producing an official commercial for the project that will be available on YouTube, iFilm and other online video sites. We are also making official McFLY 2015 button pins and stickers because there has been a huge demand from all those who have signed up, the American rock band Whirlwind Heat (they were discovered by Jack White of The White Stripes) even asked their fans to sign up so they can rock the McFLYs on stage during a rock show. A cynic can view this entire campaign as a great way to sell a brand without a product. Selling a sense of community centered around the idea of longing for the paleo-future? Brilliant. These guys are going to sell a lot of buttons and stickers. 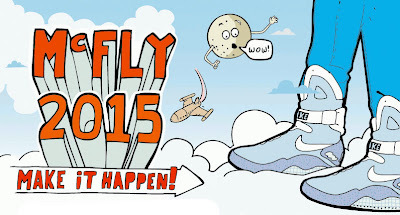 I'd be surprised if you couldn't find a McFly 2015 t-shirt soon. man! Aren't the ugly new Nikes 'futuristic' enough? I'd prefer those 'Tron' shoes by Reebok, anyway. Here are some actual pictures. those shoes are ugly. Back to the future was a cool movie and all, but that is stupid.